Provided photo A still from the viral video of Cory Morris driving Annie down the highway. Annie has now been dubbed Annie the Highway Cow. Provided photo Annie and owner Cory Morris at his rescue and home The Critters of Griffin’s Willow Farms in Ludlow Falls. Provided photo Annie “milking it” for the camera at The Critters of Griffin’s Willow Farms. LUDLOW FALLS — Holy cow. What started out as a normal week for Cory Morris and his cow Annie has turned into a worldwide viral affair. 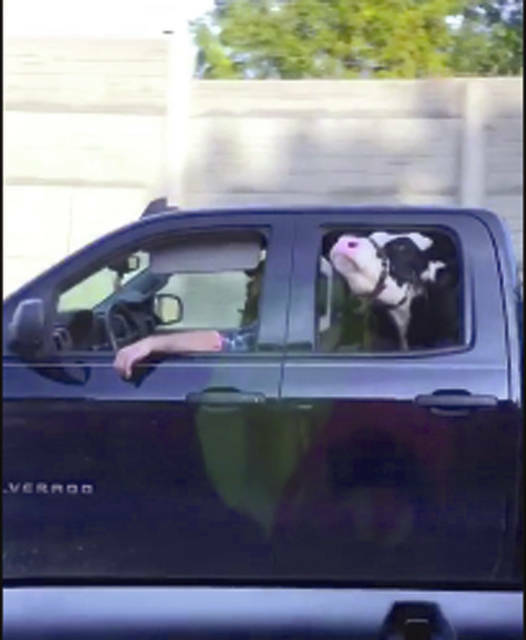 Morris was caught on video on Interstate 75 in Tipp City driving home from a petting zoo event with his 800 pound rescue cow riding in the backseat of his pick up truck — just a normal day for them. The video, taped on the highway by a passer-by, now has more than 14.5 million views on the internet, and Annie has become an overnight sensation from coast-to-coast and even throughout the world. Morris, who runs an animal rescue on his Ludlow Falls farm, The Critters of Griffin’s Willow Farms, said Annie riding in the backseat of his truck is nothing new for the duo. 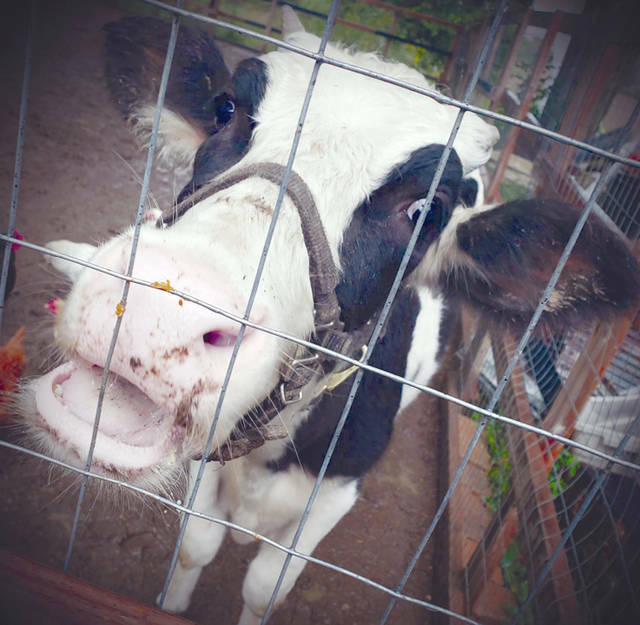 Morris said the 18-month-old cow actually wasn’t at her best in the video. Based on the video’s attention, being shown on news channels across the country — including the eye-opener segment of CBS This Morning on Saturday — Annie now has her own Facebook page at Annie the Highway Cow, her own phone number to field the interview requests coming in nonstop, and her own email where she can be reached at anniethehighwaycow@gmail.com. Morris said Annie has ridden in his backseat for a while now, not only when he goes to petting zoo events, but she will step into the truck, much like a dog, to run errands with him. Ironically, Morris said Annie also has a penchant for ice cream, which often requires a drive through McDonald’s when they are out and about. Annie, along with twin sister Jo, were rejected by their mother following birth, and Morris said he nursed the sickly animals back to health, including sleeping in his barn in January for two weeks to keep an eye on the weak calves. Annie, Morris said, had a feeding tube for weeks, and likely should not have survived. However, she now is the twin with personality to spare and seems to truly enjoy milking it for all it’s worth with humans, said Morris, the director of Event Design and Production at NCR in Dayton. Morris’ rescue is a labor of love, funded by him and the donations he receives from holding petting zoos around the area. He said he has generally has anywhere from 50-75 animals on the farm at any one time, including rabbits, chickens, ducks, goats, sheep, pigs, mini horses and donkeys — and anything else that needs a home. The “we” Morris refers to is a like-minded group of friends that help him take care of the farm and help with the petting zoo events that help fund the animals’ care. Morris said Annie now even has an official meet and greet event scheduled from 3-7 p.m. Monday, Oct. 29, at the NCR Country Club, 4435 Dogwood Trail, Kettering. He said he already has heard from a woman in Texas asking for the details so that she can drive in for the event and needed to book a hotel room close by. Annie’s sweet tooth, along with her maturing, also means her truck rides are soon to come to an end. 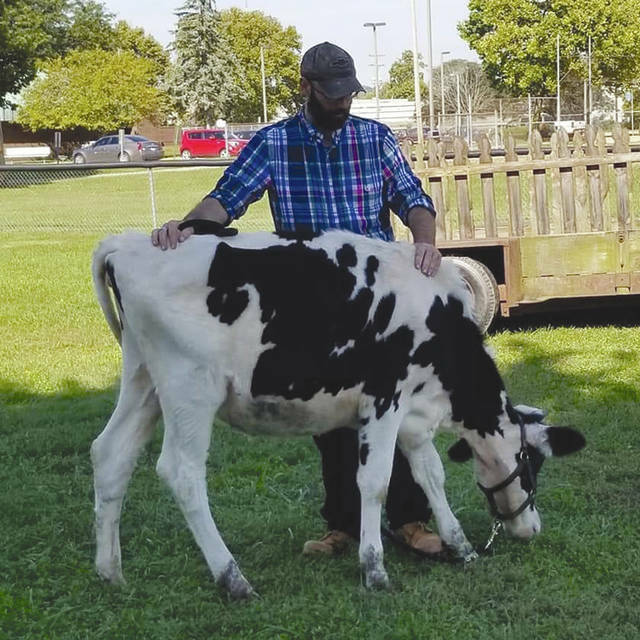 The Holstein — who eventually will weigh about 1,600-1,800 pounds — has a bright future, though, Morris said, and will live her life out on his farm. He said at the appropriate time, she will be bred with her boyfriend on the farm, Dudley, and the baby will be used as a dairy source on the farm. “So we are just enjoying this time while we can,” he said. Morris said he still can’t believe the reaction Annie has received. He said he has gotten positive messages from across the country and as far away as Hawaii and even the Netherlands. To learn more about Morris’ rescue efforts, see The Critters of Griffin’s Willow Farms on Facebook.  https://www.weeklyrecordherald.com/wp-content/uploads/sites/51/2018/10/web1_Annie_Truck-1.jpgProvided photo A still from the viral video of Cory Morris driving Annie down the highway. Annie has now been dubbed Annie the Highway Cow. https://www.weeklyrecordherald.com/wp-content/uploads/sites/51/2018/10/web1_Annie_Cory-1.jpgProvided photo Annie and owner Cory Morris at his rescue and home The Critters of Griffin’s Willow Farms in Ludlow Falls. https://www.weeklyrecordherald.com/wp-content/uploads/sites/51/2018/10/web1_JustAnnie-1.jpgProvided photo Annie “milking it” for the camera at The Critters of Griffin’s Willow Farms.